Ghosted begins its latest arc by bringing back the past. Not only does Oliver King, the skeptic turned believer of the first arc return, but we also get the notorious white room last seen in the Trask Mansion, plus a new character with an unexpected connection to Jackson’s deceased friend. While this set-up seems all well and good for Ghosted, Jackson is the wildcard for the first time. His involvement in previous heists were either through coercion or…nope, pretty much everything after the Spirit Casino debacle has been about coercion. This time though, Jackson is all out of fucks to give as the government tries to recruit him for a new mission that further expands the supernatural world of Ghosted. Starting almost immediately after the events with the Brotherhood of the Closed Book and the appearance of King with the FBI, Jackson and Nina Bloodcrow are released from prison so King can introduce them to Agent Creed. Jackson is of particular interest to Creed. He seems to know everything about him (including what happened in New Orleans, which I’m sure we’ll find out about in the future) and he wants to “offer him a job” going after the proliferation of ghosts and spirits that have come out of the woodwork for reasons that appear to be unexplained. Jackson, however, is having none of it. He could care less about what’s happening outside of his personal bubble of anger and guilt and the alternative options of prison or death sound better than helping the feds. It isn’t until Creed reveals the man who may be involved in the recent uptick in spiritual activity is the late Trick’s son and introduces Jackson to his “fan” that the con man is finally interested in what Creed has to say. 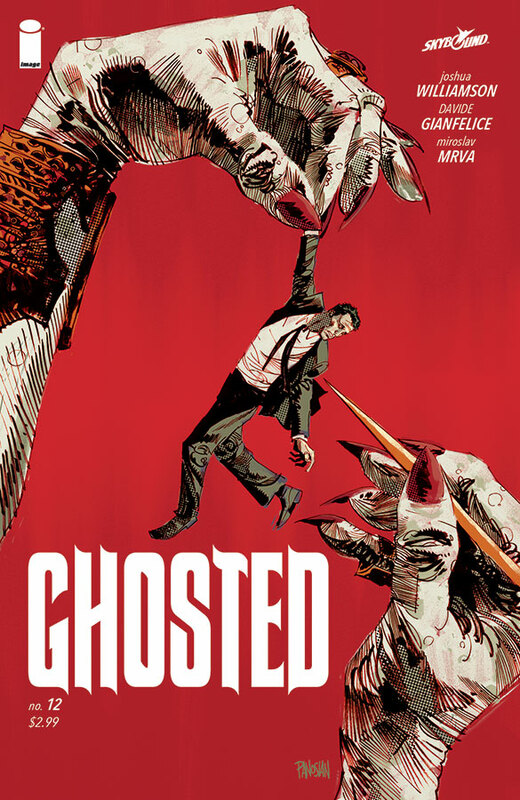 What continues to impress me about Ghosted are the many ways in which the supernatural is treated and interpreted. It’s like a check list of horror cliches only Joshua Williamson manages to make them feel fresh within the context of the world he’s created. Haunted mansion? Check. Cults and possession? Got it! Rednecks dealing in candles made of virgin blood? Ch – okay, that’s not on the list, but it oughta be! The success of these scenarios, however, is how they’re filtered through Jackson and his involvement. He’s the connecting thread but with the beginning of this new arc, we’re seeing him begin to unravel. Thematically, Ghosted has its roots in the idea of the past haunting us in ways we can’t expect. The bookends of this issue illustrate that perfectly. A woman’s stalker kills himself and while the woman is happy to move on with her life, the ghost of the stalker lingers, hovering around her and letting her know that she’s not as free of him as she thought. Jackson has a similar predicament, but his demons are less visible to the naked eye. Instead, he literally bears the scars of his haunted past, one that everyone wants to exploit to get him to do their dirty work. The loss of Trick, however, has affected Jackson tremendously. If he had even a tenuous hold on staying alive, Trick’s death has finally pushed Jackson to the breaking point. His previous attempts at goading people into killing him seem trivial compared to the anger-induced provocation of Creed when the man has a gun pointed at him. The only person keeping him somewhat anchored is Nina. 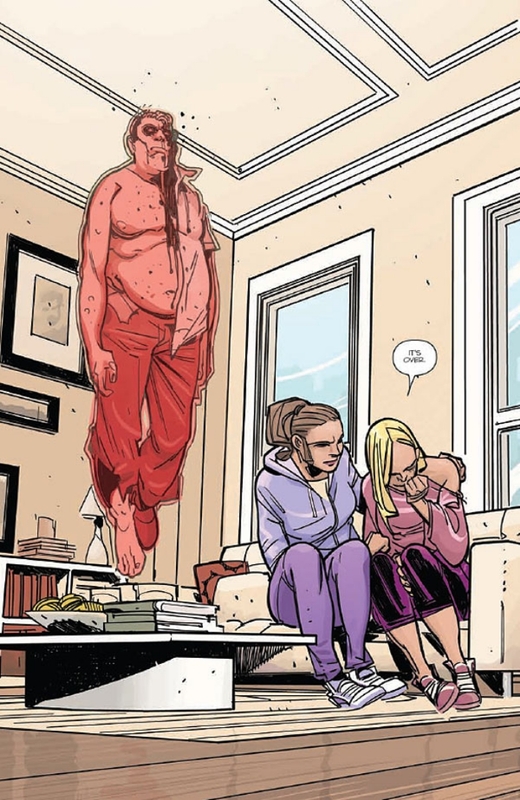 Once again, Davide Gianfelice’s art works so well within the world of Ghosted. The sketch-like quality of his art instills movement in scenes that could easily look static. Like the previous arc, Gianfelice handles the horror with a deft hand, making spirits and possessed people look grotesque yet intriguing at the same time. The ghost of the stalker is especially chilling due to the minimal dialogue as the young woman goes about her nightly routine all while the deceased hovers nearby, his blank expression made all the creepier by the gaping would in his skull. The colors from Miroslav Mrva present an interesting contrast between the living world and the dead. For most of the issue, the colors are brighter, even in the prison facility where Jackson and Nina are being held, but when a ghost is featured in a scene they’re marked by a noticeable color shift that draws the eye immediately. It’s a fantastic way of highlighting the combined efforts of writer, artist, and colorist. Final Thoughts: New story + new characters = a very excited Sam!